(Newser) – Should it ever erupt, a supervolcano beneath Yellowstone National Park could blanket North America in an ash cloud, wipe out communications, and alter the climate. Given that eruptions of supervolcanoes buried on our planet—and there are several—are thought to occur every 100,000 years or so, however, the likelihood of such an event during your lifetime is small, reports the New York Times. As comforting as that may be, new research out of Arizona State University is far less so. Whereas researchers previously thought such an eruption would be centuries or millennia in the making, an analysis of fossilized ash left over from Yellowstone's last supereruption 630,000 years ago reveals the process could take only decades. 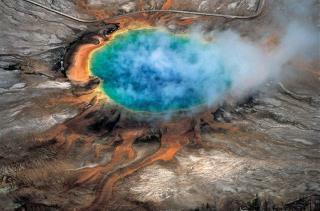 maybe a congressperson should call for an all out ban yellowstone. Well, if the New York Times says chances are extremely small that this would ever happen, we're all good!